The Belmont Edge: Horses For Courses? 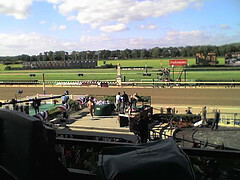 The 1 1/2 mile Belmont Park will host I'll Have Another Saturday as he runs for the first Triple Crown since 1978. Tight security measures for the 2012 Belmont Stakes starters have many wondering how settled in and comfortable the horses have been in the days leading up to the race. Their detention barn type of lockdown is nothing permanent, and in less than a week, they will most likely be moved out and moving on. For race horses, living, training, and racing at different tracks is a way of life. Some adapt better than others, and perform well across the county, and even across the globe. Then there are those that fall flat any time they leave their home track. I’ll Have Another has already shown the ability to make a quick turn around between the Kentucky Derby and Preakness this spring, but it remains to be seen whether he’ll take to and have the stamina to do what so many have failed to do. Historically, all 11 Triple Crown winners have had a race at the Belmont track before they attempted The Test of Champions. The sheer size of the largest track in the country can be a big hurdle for both horses and jockeys. Affirmed, Secretariat, and Citation all posted wins in Belmont’s Futurity Stakes as two-year-olds. This was one of the premier and decisive races in crowning two-year-old champions before the Breeders’ Cup Juvenile came along. Seattle Slew, the only Triple Crown winner to have done it while undefeated, had three wins at Belmont under his belt going into his Triple Crown campaign. The California-based I’ll Have Another won’t have the edge when it comes to being familiar with the massive track. Street Life, a solid 12-1 in the morning line odds, may have the home court advantage, but how important that is remains to be seen. Historically horses out of the west have not made much of an impact on the Triple Crown trail. This does overlook the fact that they simply did not travel as much in general in the past, compared to today, when the practice of flying horses from coast to coast is quite common. I’ll Have Another has proven that he’s not a one track horse, and while he’s come a long way from Southern California, the only real distance that matters at this point is that 1 1/2 miles he’ll face this Saturday.